29181 Steamboat Drive Menifee, CA. 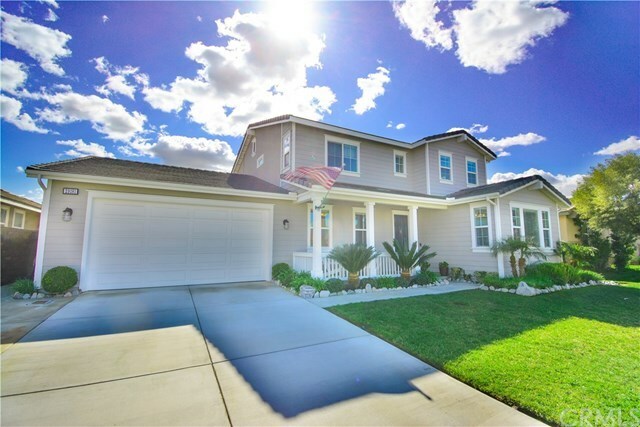 | MLS# SW19011410 | Temecula, Murrieta, Menifee Homes for Sale & Property Management! Back on the Market and priced to Sell!!! Do not miss out on this beautifully upgraded home in Heritage Lake. This spacious home offers 4 bedrooms, 3 bathrooms and over 2700 square feet. Tile throughout entryway kitchen and bathrooms and all new carpet upstairs. Ceiling fans in every bedroom and also in the family room and formal living area. Kitchen has Granite counter tops, built in microwave, a double oven, and stainless steel appliances. There is one bedroom downstairs and 3 bedrooms upstairs all "good sized". Large Master with over-sized bathtub. 3 car tandem garage with epoxy floors, overhead storage, and a sink. Beautifully landscaped front and backyard on a "pool-sized" lot. The backyard features a built in fire pit, new patio cover, dog run, and a charming fruit & vegetable garden (including a lemon tree, clementine tree, tomatoes, strawberries, grapes, raspberries, blueberries, rosemary, and spearmint). Builtin surround sound inside and in the backyard. HOA offers many ammenities Lake, Splash Pad, Pool, Clubhouse, Lots of Parks, Greenbelts & Walking Trails. Walking Distance to Schools. This home is spotless and has been meticulously well maintained, not a single detail has been looked over. Directions: Cross Streets Discovery Bay, Stowaway Dr.